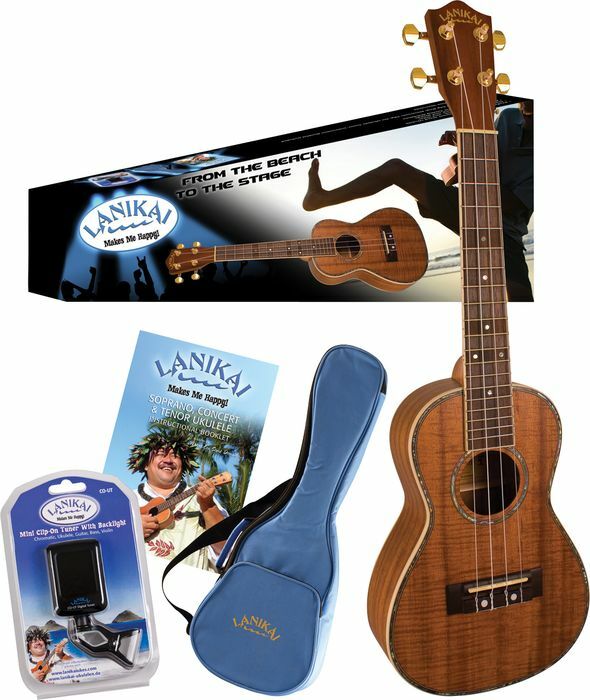 If you want an excellent deal on everything that you will need to get started playing a concert ukulele, then the Lanikai LKP-C Concert Ukulele Pack natural is exactly what the music teacher ordered. This beautiful Hawaiian koa topped ukulele is a concert sized ukulele that combines style and grace in an affordable package that makes for a great beginner’s concert ukulele and that will take you from beachside to concert stage without missing a beat. Being slightly larger than the soprano sized ukulele, the concert ukulele is a perfect choice for those musicians who have larger hands or who are having trouble handling the narrow frets. The concert sized uke is an excellent choice for those musicians who are looking to switch from guitar to ukulele, or for those who got their start playing the ukulele and would like to move up to a larger instrument, but who are not yet ready for a full-sized guitar. It is not just the size that makes this instrument so appealing; however, it’s also the tone. Made with a koa wood top, this ukulele has a deep, woody tone that will enchant those that you play for, and its abalone rosette and elegant body binding add classy touches that you will love, and at a price that even beginning musicians will find affordable. Lanikai Hardshell Concert Ukulele Case for just ~$39 extra. See more great guitar reviews at Lanikai Ukulele. Join in and write your own page! It's easy to do. How? Simply click here to return to Lanikai Ukulele.